So, it is still winter – even though this winter of 2014/2015 in Europe is a joke… Far too warm, where is the snow? Still, given the lack of light and the ridiculously long persistance of my hangover from New Years Eve, I thought it would be a good moment to brighten up my days with some yummy food. 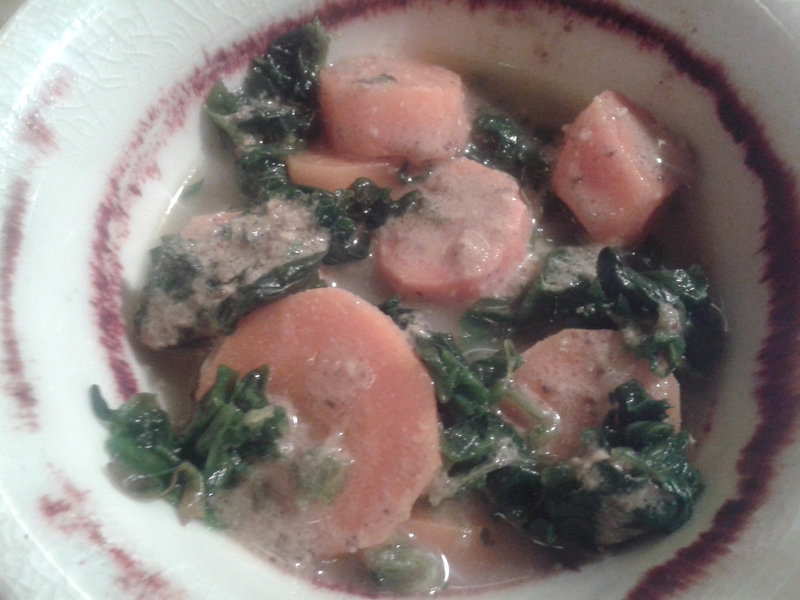 The soup I am presenting here is ideal for that: it is very tasty, has unusual tastes, it is filling and easy to prepare (a good choice if you have to cook for other people like I do at the moment). The combination of ingredients is rather unusual (at least for Western cuisine), so it’s a good change of daily routine. So, basically you peel the carrots and cut them into thin (not too thin) disks. Also, cut the onion and the shallots into small pieces and roast them in a cooking pot. If you use dried coriander as spice – add the coriander, the vegetable bouillon cube and the chillie ad this stage to the onions. In the meantime, juice the lime. Wash the spinach leves till it is cleared of dirt. Once the onions are about to turn brownish (at least parts of them) add the carrots and fry for 3 more minutes while stirring the mix. Then add the spinach, and the lime juice. Cover the vegetable with water, so that it is just covered (rather little than too much). Add the almond flour and the salt and allow it to cook untill the carrots are medium soft. Voilá! Also, be aware that this soup is best eaten fresh and less adequate for being kept in the fridge. If you want to re-warm it for a second round, add some additional lime juice and chillie.